The only thing constant in life is change. People come into and leave our lives. Our surroundings continuously to evolve for one reason or another. Memories of the past are what we have to hold on to for the important chapters of the journey that leads to our present. Through the keeping of concrete objects or the transformation of memories into images, memories adopt a new form. This is what makes Shiu Sheng Hung’s exhibition, The Images Left Behind, highly relevant and inspiring as he explores the fluidity and preservation of memories as a defence mechanism against the change of times and surrounding environment. The show might appear highly conceptual at first glance: a translucent wall painting, a drawing from the artist’s late mother, an installation made up of vintage postcards and a pile of acrylic paint layers lying on the ground set against some old wood planks propped up against the wall. What seems to be a collection of random objects is essentially Shiu’s attempt to challenge not only our perception of memories but also our imagination of the past with a poetry written in his own brand of visual language. By taking a moment to immerse in the artistic world of Shiu, we contemplate what could be done to preserve the past and make sense of a present that can vanish imminently. Shiu says, in his artist statement, that he has the urge to re-examine the relationships between memories, material objects and capital in the face of the uncertainties and constant change of his life brought upon by the passing of family, disputes over family land ownership issues and the exchange between money and material wealth. “Whether it is our own personal life or the environment we live in, we are incessantly dealing with the unknown future and losses we fail to hold on to,” he says. The journey of The Images Left Behind begins with “Mother’s Sketch” a work highly personal to Shiu. A pencil drawing of a tree by Shiu’s late mother framed against a black backdrop is juxtaposed with a photograph of a construction site at a historic building in traditional Taiwanese architecture near the artist’s family home. The sketch of the tree offers a glimpse into Shiu’s roots for some of his works such as his Landscape series. But pencil as a medium is unstable. It fades over time, can be easily rubbed off or erased. By framing the drawing, Shiu is doing his best to hold on to the drawing, and symbolically his connection with his late mother. This treatment echoes the shade of blue filter applied onto the adjacent photograph. We do not know exactly what is happening to Shiu’s family home, but a construction site and a shade of blue, combined with the title “Drama” suggest that the viewing of this piece of architecture could be its last, and the photograph could be the last straw to preserve the site that has intrinsic value to Shiu and his family. “Mother’s Sketch” is perhaps Shiu’s personal visual memento as opposed to the vintage postcards that he has been collecting from all over the world and hung on recycled industrial metal racks in the work titled “Time Lapse”. Before the age of social media or even the invention of cameras, postcards were the only option available for people to share their visual memories with their beloved. Each of these vintage postcards sent from Kassa in Slovakia, Hong Kong, old Taipei, New Zealand, Cannes in France, Isle of Wight in England embodies not only the sender’s memories of the place but their attempts in maintaining contacts with the postcards’ addressees. And the fact that these postcards ended up in Shiu’s hands suggests they were lost or no longer wanted items. But does it mean the memories, connections and places or monuments depicted are also gone with the loss of these postcards? Not necessarily. The images and messages written on postcards have inspired Shiu to conceive paintings that appear in their most unusual form. Acrylic paint is layered over weeks. Each layer takes one to two weeks to dry before the next one can be painted on. The entire process may take months to complete. While waiting for the layers to dry, the artist would spend his time on other matters, paint other works or continue his daily life. Once satisfied, the artist peels the resulting works, skin-like, from the detachable support and arranges them on the floor of the gallery. The resulting work, called “Skin, Rubbles, Lies and Intuitions”, serves as record of the emotional state of the artist captured over a determined time duration. For Shiu, this is almost a self-imposed visual diary of his emotions. Each layer is painted with a different mood and experience creating in effect a visual log of his feelings over a period of time. Metaphorically, it resembles what is left by a snake that has just shed its skin. Inspired by an imagination of the past, it might appear incomprehensible to anyone from the outside, but to those who emerge from this process of reinvention, the “paint skin” is a solid proof of the experiences that shape them into who they are, just like the shed skin bears the physical marks of a snake’s experience over a past period of its life. Facing the paint skins are old wood planks made from reclaimed antique Taiwanese cypress wood and used as table tops when the artist found them. Cypress wood was widely used when Japan colonised Taiwan but sourcing timber from the protected cypress trees is prohibited today. Cypress wood furniture or objects found today are either historical or made of materials sourced from old objects or demolished houses. The original form of the cypress wood is forever gone, but the memories that these pieces represent stay on as they are given a new life by being utilised and reinstalled. Is this the only way to keep our memories alive? During the installation of the “paint skins”, and at each subsequent arrangement in a new exhibition place, little dents, scratches and distortions are inevitable. 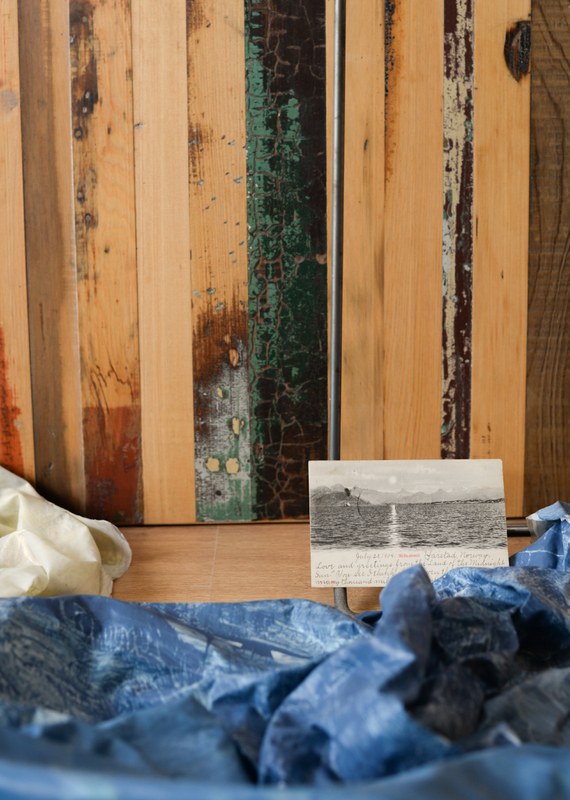 Just like the cracks and holes on the wood panels and the stains and tears on the postcards, the accumulated marks on the “paint skins” point to the nature of memories – perhaps flawed but nonetheless present. Audiences are challenged by these issues when they stand before the mural painting that Shiu creates at the gallery. He covers one of the gallery walls with pearlescent paint, the visual effect of which is subject to the daylight coming through the windows from the adjacent wall. The title of the exhibition is left unpainted on the wall and can only be seen when the light is at the right level. In face of a painting that is set to vanish the moment it is created, how should one deal with such inexorable situation? Snap a picture with a mobile phone camera or spend a few more minutes to focus on the details and memorise the experience as much as possible? Taking a photo that will never be looked at again might just take up some memory space on the phone but meditating in front of an artwork could leave far more meaningful and permanent marks in one’s memory. The Images Left Behind is Shiu’s invitation for an intimate journey that explores the fluid and unpredictable nature of memory and their rhetorical role in shaping the present and beyond. In this regard, the young artist has created a subtle yet powerful show that is highly pertinent to our times. Born in 1987 in Kaohsiung, the south of Taiwan, Shiu graduated from the Tainan National University of Arts’ Graduate Institute of Plastic Arts with an MFA in 2014. The award-winning young artist has been exhibiting as a painter since 2008 and over the years has expanded his oeuvre from painting to articulating his artistic thoughts through a range of media. The Images Left Behind is a bold experiment for Shiu, who puts away the paintings he is best known for and instead adopts a conceptual approach to the subject of memories, a recurring theme of his art.